The presentation of two figures who embrace each other or clasp each other belongs to the beginning of the unique iconography of George Minne. Couple Embracing and Men Fighting both date to around 1886 and are possibly his earliest moulded sculptures. 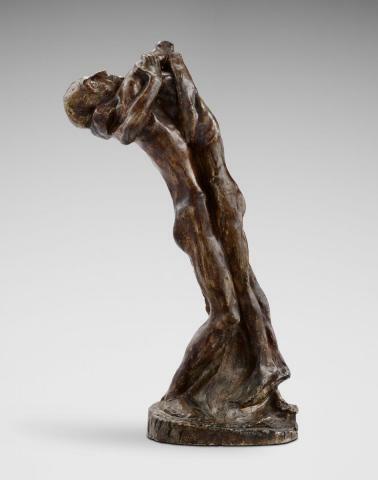 An expressive highpoint was reached by Minne in The Prodigal Son from 1896, in which he renders the nearly unbearable moment of reconciliation in a powerful embrace. Minne thus gives the theme of The Prodigal Son, that in that time is rather popular, a new dimension. 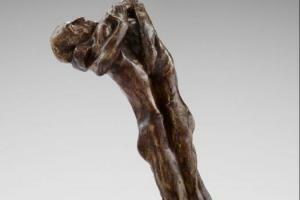 The daring line in the model in Minne's sculpture is possibly related to the working manner of Rodin, but with his unusual expressivity, rendering of form in the body and strong expression of feeling, The Prodigal Son already anticipates Expressionism. It is interesting in that vein to compare his vision with the more modest and moderate take that Constantin Meunier uses in his version of The Prodigal Son (also known as The Reconciliation, MSK) at more or less the same time. Instead of the rather classical view of Meunier, however, Minne carries out the emotional tension of the reunion of the father and son to the extreme. 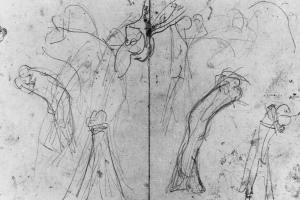 His drawn studies show how Minne with a few poignant and taught pencil lines searches for the solution of how to render the smelting together of the figures. The plaster exemplar of The Prodigal Son belongs to the collection of the Museum of Fine Arts of Ghent. 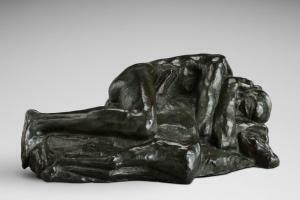 In addition, there are also bronze copies including the one in the M Museum in Leuven. Man Grieving over a Dead Deer, also from 1896, is perhaps less expressive, less extraverted, yet is of a great innerness and simultaneously deep despondency. The melding between both bodies articulates a need to turn one's self from the world and to go into another one, and into death. Man Grieving over a Dead Deer is executed in plaster, bronze and marble. The MSK holds one of the bronze versions, a marble copy is found in the Folkwang Museum in Essen. As already in his works, Minne also here transcends the theme of the embrace the purely narrative and momentary. Here it deals with the spiritual experience of a union with the other and of the insoluble entanglement of eros and thanatos, of love and death, the theme par example of Symbolism.